In the course of editing the writing of clients, I encounter much in the way of ticks and bad habits, not to mention sheer ignorance, particularly in the writing of beginners and illiterati — of which I edit more than I’d like — in addition to the usual complement of routine mechanical errors. Some booboos are laugh-out-loud hilarious. (If I didn’t allow myself to fulminate at and even ridicule (privately) some of the manuscripts I work on, I wouldn’t be able to do this work at all.) Other clinkers are illuminating in that they reveal modes of thinking on the part of authors that can be picked apart and learned from. One of the most powerful features of the ubiquitous Microsoft Word text-whacker, one that is underutilized or even unknown by authors who work alone, is its ability to track changes from version to version. This function works well. A heavily edited manuscript ends up having a forest of marks on it that leave it looking like the image at the beginning of this article. 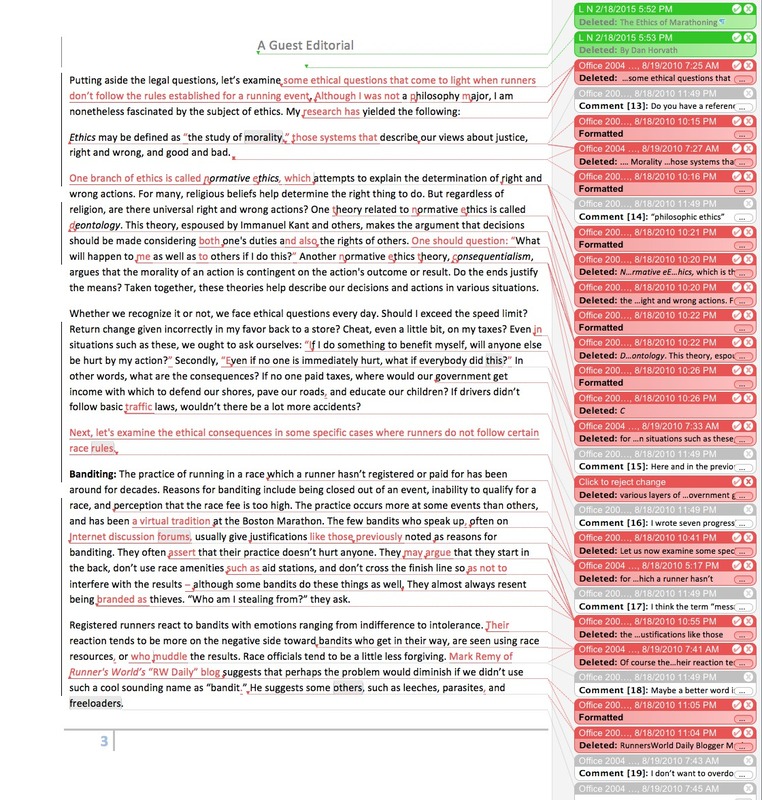 When an editor is done with a manuscript, the author can go through and accept or reject changes, or having had a matter brought to light, might make a different change. For instance, if I delete the word very before large (because very is such a wimpy word that I routinely uproot occurrences like dandelions), the author might still wish to intensify the idea of largeness, so will delete large and substitute huge. But comments take time to write, which has an economic impact on productivity. More importantly, marginal comments are not the place to go into detail or to give English lessons. 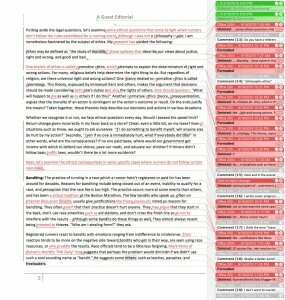 Most of the time the editor is obliged to move on in order to get a job done. But certain problems stick in your craw. At least they do for me, with the result that I may scribble out a few relevant lines in one of my many electronic notebooks. I’m planning to write an ongoing series of short articles about craw-stuck problems I’ve encountered in the wild, that is, within manuscripts I’ve worked on, and to illustrate points with sentences taken from client work, suitably anonymized so as to avoid copyright infringement, letter bombs, and other negative fallout. The text in the image is from an article by Dan Horvath in Marathon & Beyond magazine article that I edited a few years ago, used with the permission of the author. The actual content is irrelevant to this discussion. This entry was posted in Editing, Language, Opinions, Thoughts, Track Changes Meditations, Usage, Writing. Bookmark the permalink.